Urban Warfare are moving their shop to Glenfield on the North Shore and have a relocation sale starting this Saturday the 7th. We had a little more than the usual sad looking two or three tables set up today, so now you can see a picture of the club in action in the new hall! DBM 25mm - Grant and Wayne played an Auckland Club comp game. 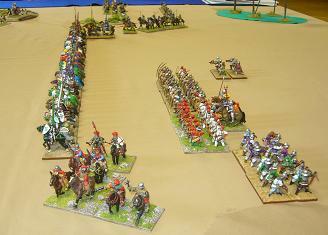 The Portuguese and Swiss battled hard, but neither army was broken at the end of the game. DBMM 15mm - Nick (Ottoman Turkish) played Benny (Alexandrian Macedonian). A good shot by the Turkish artillery took King Philip out of the game, so Alex gets to take over the army after their 25-0 defeat. DBMM 25mm - Philip's Kushite Egyptians won a 20-5 victory over Al's Spartans. Not a good day for Greek commanders, as Brasidas never got to show off his brilliance, being crushed by the Egyptian sub-general in a chariot. DBR 15mm - Craig (Valois French) v John (Minor German States), 1555AD. 500AP. Despite the Germans' cunning deployment, the French won the day 10-0 primarily by getting the Swiss to do most of the fighting. The yodelling fanatics, deployed in a single large block in the centre, and crushed the larger Landsknecht pike block opposite. The large German centre command could not sustain the huge casualties from the Swiss onslaught and fled ignominiously, leaving the Swiss to pillage the cheese supply in the German baggage. Today's game was something of an experiment, as we were playing without the 'separation anxiety' rules. We felt this made the game more enjoyable and contrary to expectation did not lead to lots of deliberate fragmentation. DBR 25mm - Scott (Later Polish) beat Andrew (Manchu Chinese with Ming allies) 9-1. The Annual General Meeting was held today. These are the games we played at the club today. DBMM 25mm - Rob's Portuguese (with Very Early Tudor English allies) beat Philip's Kushite Egyptians. The Portuguese lost one command winning 20-5 under the new scoring system. Despite being crushed by the Portuguese knights, the Egyptians left the table happy in the knowledge that their chariots are now allowed on 60mm deep bases. DBR 15mm - John's Maximilian Imperialists (with Early Tudor English allies) conceded defeat to Craig's Valois French. Flames of War - Late war breakthrough scenario. Brett's Russians beat Kit's Germans. The Russians suffered heavy casualties to most platoons including masses of infantry and the T70s which gamely assaulted infantry in woods (but they only lost one platoon in the end). The German company morale finally failed after the loss of their C-in-C and several platoons. The North Island Convention Nicon was on this weekend in Cambridge. The racecourse venue was a good one, with plenty of room for the tables, especially important with a turnout of almost 100 players. There were a dozen of us from the NSWC entering the competitions in DBM, DBR, Flames of War and Warhammer. Grant took the title for DBR 25mm for a second consecutive year with the Swiss, followed by Philip (2nd, Early Tudor English) and Danny (3rd, Scandinavian Union). One of the DBR games is pictured here (Tudor English vs John's Japanese, a grudge match from the previous Nicon, with results reversed.) There are more pictures of the DBR comp on the Renaissance page. Kendall and Lee showed what decent chaps they are by winning the Best Sports awards in DBM 15 and 25mm respectively, and they managed to sneak a game of DBMM into the DBM competition. A trade stand was doing good business selling copies of DBMM and other wargaming gear. There were no bids for Nicon 2008, but several clubs are considering options for next year's convention, including the Manawatu Duellists from Palmerston North. 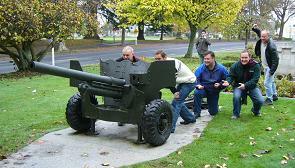 A six-pounder is on display outside the Cambridge Town Hall. Well, we couldn't resist playing with it, could we? A few games at the club today included a couple of brand new DBR armies taking the field for the very first time practicing for Nicon - the Poles and Danes(pictured below). WHFB - Nick's Empire took on Mark's Brettonians. 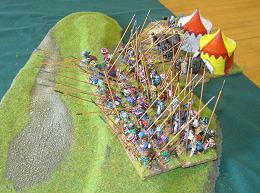 DBMM 15mm - Kendall (Normans in Italy) beat Ian (Wars of the Roses English). The Norman's allied contingent of psiloi and auxilia did all the work clearing the terrain, and their army overall only lost 4ME. DBR 25mm - Philip (Early Tudor English) 9-1 Scott (Later Polish). A very closely fought game with only a couple of elements in it at the end. The English artillery did great work, and the Polish Pancerni cavalry did the hard fighting while the winged lancers sat around looking pretty. DBR 25mm - Danny's Early Danes were winning the game against John's Japanese when time was called. The Japanese muskets didn't save them this time. It's the end of the line for Battlehaven who are closing down at the end of May. Until then there is a 30% off sale in their shop at 308 Great North Road. Want to play 40K or Fantasy with a range of opponents? Have a range of armies you want to try out? Haven’t quite finished painting them but still want to play? Just started learning to play and want to learn more? Then City Guard has the thing for you. Starting on Sunday June 3rd we are running new two-month leagues at our weekly club meetings. They are fun and casual “opt in” leagues, where anyone who turns up can join in. Whoever turns up at the Sunday meetings will pop their names into a hat, and opponents will be randomly drawn. 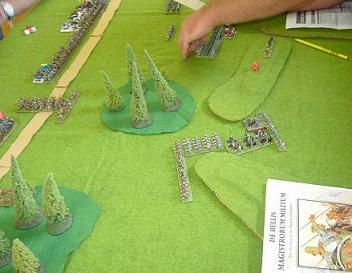 All armies are accepted (painted or not), and each player who turns up should come prepared to play a range of point values. It is recommended to come prepared (have lists ready) for armies from 750pt to 1850pt for 40K and from 1000pt to 2500pts for Fantasy, if you have the physical armies to play them. Each week the games will be recorded (wins 3pts, draws 2pts, loss 1pt) and points added together at the end of the 2 months. Today was the final meeting at the old venue. We had a shorter than usual meeting and then packed up and moved all the club property to the new location, the Forrest Hill Scout Hall in Becroft Park on Becroft Drive. Thanks to everyone who helped with the move, especially to Robbie for organising it all, and thanks also to the Scout Groups for making the venue available for us. WHFB - Mark played a couple of games with his Brettonian army, first against Nick and later against Josh's Tomb Kings. WHFB - Rob's Empire took on Aaron's big green chaos hordes, getting in some practice for Nicon. DBM 25mm - Wayne (Swiss) beat Helois (Jalayirid) playing a game in the Auckland Club champs. DBMM 25mm - Philip (Kushite Egyptians) and Kendall (Early Imperial Romans) had a Nicon training game. 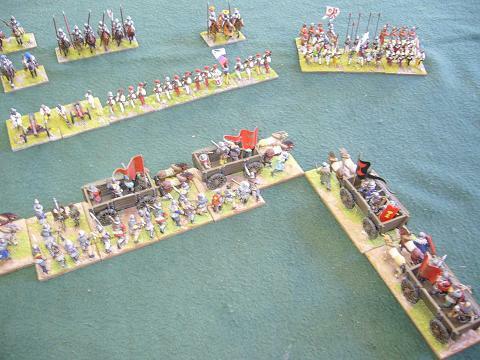 The brilliant Roman general used a short hook manoeuvre which was defeated by Egyptian chariots that had to redeploy quickly. The Egyptian strategem of "Exaggerated Army Size" was amusing but ineffective as the Roman infantry ignored the numbers and attacked anyway. 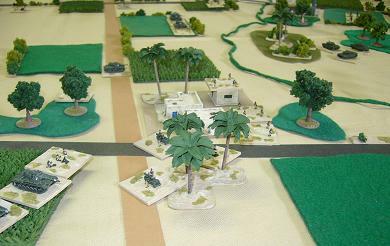 Moderns 1/300 - Roland and Grant had an Indo-Pakistan War game using the Cold War Commander rules. It all looked very picturesque as you can see below. WHFB - Matt's Ogre Kingdom army won a decisive victory over Aaron's Vampire Counts. DBR 15mm - Philip (Algerian) beat Ian (Venetian) 7-3. The Venetian cavalry wing of lancers and light horse charged the opposing Algerian force of Sipahis, light horse, and bows. 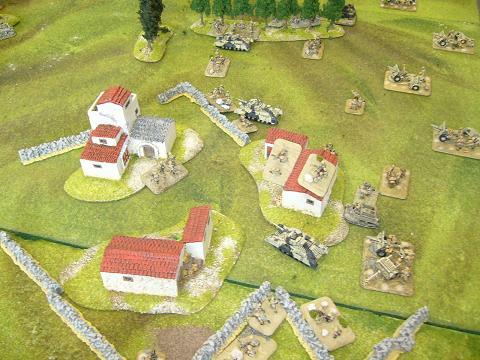 Dreadful combat dice saw the Venetians routed for no loss to the Algerians. On the other wing, the Algerian C-in-C led a force of artillery and crossbowmen across through the rivers and swamps but was shot to pieces by the Venetian artillery firing from fortifications. In the centre of the battlefield, massed superior warbands with some janissaries in support fought off a lancer attack and defeated the Venetian infantry. Flames of War - Kit's Early War French defeated Kendall's Mid-War Germans. One German Tiger made it to the objective, but was then surrounded and it's crew surrendered. We seem to be going through something of a quiet period at the club, as again there were only a few games happening today. We did however see the first game of DBMM using the newly published set of rules. WHFB - Rob's Empire beat Aaron's Vampire Counts. After a good cannon shot the Vampire Count became a headless horseman. WHFB - Mark's Brettonians took on Nick's Dwarves. DBMM 15mm - Lee (Wars of the Roses - Lancastrian) beat Kendall (Hundred Years War English). It seems the answer to Bw(S) is more Bw(S). Many of our club are away at the Nationals this weekend, so we had a very quiet meeting with just a couple of games. WHFB - Rob's Empire played Matt's Orcs and Goblins. The Orcs were doing well, but at the end snatched a draw from the jaws of victory! DBR 25mm - Andrew (Manchu Chinese) beat Philip (Early Tudor English), winning 9-1. The English were able to hold off one flank attack and defeated the frontal pinning force, but were defeated by an overwhelming force of Manchu cavalry on the other flank. Natcon is on this weekend in Upper Hutt. We have players in DBM 15s, DBR, Flames of War and WHFB. Good luck to you all! News from Natcon - Paul returned with a trophy cabinet full of prizes for winning the DBM 15mm Nationals and South Pacific Championship with the Komnenan Byzantines. Brett's Early Samurai won the best painted army award in Ancients. In the DBR competition, Grant (Safavid Persians) took first place and won the South Pacific Championship, and Stu (Louis XIV French) took third place. Kit's French won the best painted army prize in Flames of War and was placed 3rd in the competition. Next year Natcon will be in Christchurch. There was a little more activity in today's club meeting, including a couple of practice games for the Nationals coming up in a couple of weeks. WHFB - Nick (Empire) played Matt (Orcs and Goblins). WHFB - Aaron (Big Green Chaos Things) played Matt (Orcs and Goblins). DBM 25mm - Philip (Kushite Egyptians) beat Helois (Jalayirid Mongols) 9-1. A long thin line of Egyptian archers held off the massed cavalry charges. A promising Mongol assault on one flank broke an Egyptian command of Knights, but the flanking move was halted by a sandstorm, allowing the Egyptians to press on frontally to get the win. DBM 25mm - Lee (Alexandrian Macedonians) beat Philip (Kushite Egyptians) 10-0. A straightforward frontal assault won the day for the Macedonians. The phalanx was deployed in a long shallow line to match the Egyptian frontage and it struggled against the massed Egyptian archery, however both wings won their combats decisively. An Egyptian flank march (the same command that was beaten in the game against the Mongols) arrived and sacked the Macedonian baggage, but didn't otherwise help save the rest of the army. DBM 15mm - Brett's Early Samurai defeated Andrew's Ancient German warbands. DBR 15mm - Grant's Persians won a 10-0 victory over Ian's German Catholics. WWII 15mm - Kit and Kendall played a game of I Ain't Been Shot, Mum! WHFB - Nick and Mark played a couple of games. In the first, Nick's Dwarven firepower won a decisive victory, but in the second they were defeated in close combat. Art of War 25mm - Paul (Bactrian Greeks) played Philip (Kushite Egyptians) using a test version of the new AoW rules. As a first trial game it went pretty well. The Egyptian cavalry chased away opposing light horse and overran some archers, while the Greek phalanx defeated the Egyptian infantry. A win to the Greeks. DBMM 25mm - Helois (Jalayirid Mongols) beat Brett (Medieval Germans). The German infantry centre protected by wagons held out against the cavalry attacks, but both wings were enveloped by Mongol cavalry. When the German Emperor, surrounded on all sides, was destroyed, that was the end of the German army. WHFB - Nick and Rob played a game, both using Empire armies. BattleCry seemed a little quieter this year. Our club was well represented in the DBM doubles competition, and we had a couple of players in Flames of War as well. There was a TV3 news report about the event. 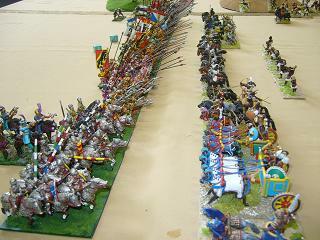 The pictures on the left shows a DBM game with Brett and Nick's Medieval Germans attacking the Patrician Romans of Richard and Ivan. Brett and Nick came 3rd overall in the competition, and Richard and Ivan took first place. On the right is the game between the Kushite Egyptians of Andrew and Philip taking on the Swiss pikes of the Watt brothers. Pictured below is Kit's victorious Punjabi rifle company. WHFB - Rob played Jono. 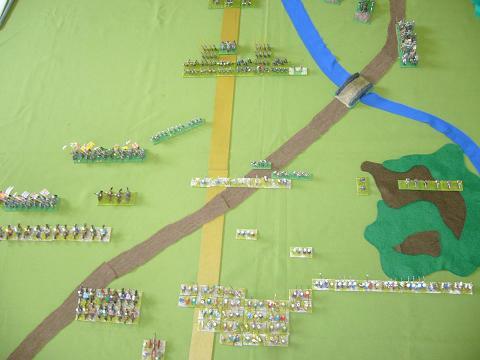 DBR 25mm - Philip (Henry VIII English) beat Kendall (Hussite). The newly painted Hussite warwagons suffered some mechanical failures, being destroyed not only by the English artillery but also by attacks from longbowmen and demi-lancers. WHFB - Rob Snr (Beasts) vs Matt (Orc & Gobbo). Win to Matt. WHFB - Aaron (Nurgle) vs Nick (Empire). Win to Aaron. WHFB - Nick (Empire) vs Mark (Brettonian). Win to Nick. WHFB - Jono (Empire) vs Aaron (Nurgle). Win to Jono. DBM 25mm - Benny (Carthage) vs John (Nippon). Win to Benny. More info about the BattleCry 2007 convention (10/11 Feb) is on the website www.theamericaclub.net.nz/battlecry2007. BattleCry has a 25mm DBM doubles tournament with 12 teams (including three teams from the NSWC), and competitions in 40K, Flames of War (mid-war), 6mm Moderns, a Hordes/Warmachine wargaming tournament, and if there are enough players there will be a BloodBowl tournament on Saturday night during the board games and social games night. A new wargaming shop has just opened in Grey Lynn. It's called Battlehaven and is located at 308 Great North Road. Their website is www.battlehaven.co.nz They stock ranges from Games Workshop and Flames of War, and have Vallejo and Citadel paints. The shop has a very large area with games tables, and a cafe as well.